It's the favorite time of the year for tech buyers as Black Friday is just around the corner. That expensive thing you’ve been longing for all year is finally going to be reasonably priced. Now you can score an amazing holiday gift for that special somebody, even if that special somebody is yourself. Just like door-busting television deals, we’ve seen some killer deals on 4K displays and high refresh rate gaming monitors. In recent years, we may have cautioned against buying 4K televisions and displays due to steep hardware requirements for 4K gaming and a lack of streaming content. Luckily for us, newer graphics cards like Nvidia's RTX 2080, and of course the GTX 1080 Ti, make 4K gaming truly playable. Multiple streaming services like Netflix and Amazon have also caught up and can stream in 4K too. If you’ve seen a 4K television in action, chances are you know that a verbal description pales in comparison to the real deal. Just a few years ago 4K displays were in the thousands of dollars, well out of the reach of the general consumer. On this Black Friday, you can find a massive 4K TV for less than $500. For us fortunate PC gamers, this means 4K gaming displays are discounted too. Upgrading from a 60Hz monitor to a 144Hz monitor makes a world of a difference, similar to the leap from 1080p to 4K. On a higher refresh rate monitor, even simple mouse movements while browsing the web are more satisfying. This translates even better once you start experiencing silky smooth gaming at 120 or 144Hz. After making the swap, it's hard for us to go back to a lower refresh rate monitor which is an unfortunate drawback when gaming on most 4K monitors. Fortunately, there are plenty models to go around, including AOC's recently released curved 144Hz Freesync gaming monitors. Just like when new graphics cards come out, current generation models start seeing some serious price cuts. We've already begun seeing this with 4K gaming monitors and 1440p 144Hz down to around $200-$300 and 1080p 144Hz displays even cheaper. We're expecting to see even better deals once Black Friday rolls around. If you’re someone who prefers to play their games on a big screen, then the future lies in 4K. Gaming on a TV removes some of the benefits you get from a monitor, such as faster response times and anti-screen tearing technologies like FreeSync and G-Sync. However, sometimes you just want to engulf yourself in a game, and there’s no better way of doing that than having a display which takes up your entire vision. 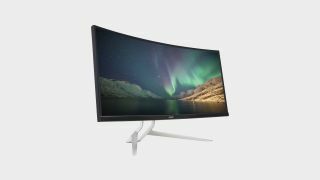 The largest computer monitors range from 34-inches up to 43 (and we can't forget about Samsung's CHG90 and Dell's UltraSharp 49), which is more than enough for some, but if you are in the market for a new big TV for your games, and you’ve got a fairly modern PC, the only reason not to get a 4K TV is the premium price. Samsung has a frankly ridiculous 110-inch UHD display, which you can feel free to buy if you’ve maybe created a popular social media platform, or have won the lottery several times. Even the 78-inch Samsung KS9800 is probably too big for most, so for the rest of us, the TVs between 50-60-inches are more likely in our price range. PC Gamer’s best TV for gaming article has an option for the high-end, the mid-range, and the entry level, so keep a keen eye out for these particular models as well on Black Friday.